The case of a disgruntled P.I. with mysterious enemies is set in atmospheric 1930s New Orleans. 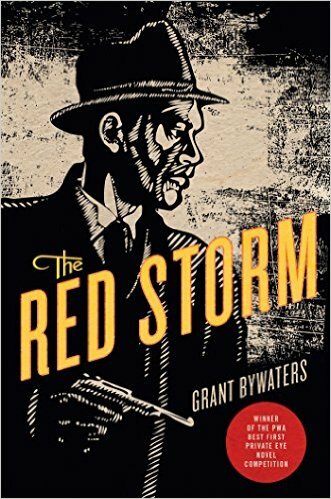 Grant Bywaters employs his expertise as a licensed private investigator in his first novel, The Red Storm. William Fletcher was a 1920s black prizefighter whose ambitions for the heavyweight title were frustrated by the prejudices of his day. After the end of his boxing career, he becomes a P.I. in New Orleans, a city Fletcher credits with a “more lax view on segregation.” He struggles to make a living, though, so when a contact from his old life shows up more than 15 years later requesting help, Fletcher reluctantly agrees to investigate, even though Bill Storm is a wanted murderer. Storm wants to find his estranged daughter. But as soon as Fletcher contacts her, violence breaks out around both Fletcher and Zella Storm. What, exactly, has Storm gotten him into? Fletcher is a loner, with racial tensions adding to the distinctive anti-authority stance his profession tends to take. Zella is a peppery character, with an ambitious career singing in French Quarter establishments that would rather she just take her clothes off. Bywaters evokes a recognizable New Orleans and surrounding swamps, and the police are hard beset by organized crime, both local and inbound from New York City. Fletcher may be just the man to help out, if he can keep himself and Zella alive. The Red Storm‘s plot is solid, but it is the setting in both time and place that distinguish this classically styled noir P.I. story, which Bywaters flavors with period slang as liberally as a Creole cook spices food. This review originally ran in the December 22, 2015 issue of Shelf Awareness for Readers. To subscribe, click here, and you’ll receive two issues per week of book reviews and other bookish fun!